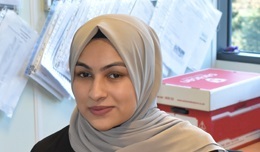 For National Apprenticeship Week, Amirah Khan shares her experience on what it’s like being an NFER Business Administration Apprentice. I had always seen myself going through a practical route rather than the academic route which is why I chose an apprenticeship scheme. I felt more comfortable knowing that I’d be able to earn, learn and develop a variety of skills and experiences while working towards a Level 3 diploma qualification. I started think about apprenticeships in early 2016 as I neared towards the end of my time at sixth form. I was in the process of completing my Maths and English GCSE retakes alongside a BTEC Business Level 2 and Work-skills course. With the help of a careers advisor at my school, we both believed that I’d be best suited to do an apprenticeship. Although, I could have completed my A Levels I chose the apprenticeship route. After speaking to my neighbour who works at QA, a training provider, on the types of apprenticeships and what they offer, I decided to apply for an apprenticeship. In the summer of 2016, I passed both my Maths and English GCSE and was ready to start an IT traineeship with QA. The course was 12 weeks, which included a six-week work placement. My work placement role was as at a small telecoms company in Iver as a digital marketing trainee. During my time, I gained a lot of skills and experience in web design and Photoshop. I also wrote an article for a business magazine, used and updated social media networks in a professional capacity and wrote case studies for the website. After completing the IT traineeship, QA assisted me to find an apprenticeship more suited to what I wanted to do which was digital marketing. Although I had a couple of interviews for a digital marketing role, I turned them down, as I couldn’t see myself working for those companies. Then the Business Administration role at NFER came up, which sounded like an amazing opportunity, so I took it and it’s probably the best decision I’ve made. My role as a Business Administration Apprentice allows me to rotate around various departments within the organisation. So far, I have had the opportunity to work in HR, Finance, Survey Support / Research Product Operations (RPO), Facilities and Sales, Marketing and Impact (SMI). I love what I do here because I’m constantly learning new things and each day is different. I can be arranging meetings, assisting with the dispatch process of our products, or processing invoices. A few months ago, I joined the NFER Social Committee group. The group are responsible for organising social events for staff such as cake sales, coffee mornings and fun activities that staff can take part in. We recently hosted a Christmas Fair and are currently planning yoga sessions for staff. I started my apprenticeship with the intention of getting a job in the marketing sector, however, now that I have gained experience in each department, seeing how they work and the different roles within them, my career goals have now changed. I am now debating whether I want to pursue a career in marketing, HR or project management as I have now developed a strong love for them all! I would definitely recommend an apprenticeship to anyone and everyone. I believe doing an apprenticeship has opened my eyes even more to thinking about the future and where I’d like to be. I also feel that it’s given me the skills and experience to be able to adapt to different situations and that I am now more organised. Going down the apprenticeship path can give you the confidence to come out of your shell and input your knowledge and skills to the business’s productivity and development. Your ideas are always heard and considered. I am thankful to have come across QA and those who have helped and supported me through my journey so far! Categories: Careers, Education to employment | Tags: apprentice, apprenticeship, Business Administration Apprentice, Business Apprentice, Careers education and guidance, Choosing an apprenticeship, National Apprenticeship Week, National Careers Week, National Foundation for Educational Research, NFER, NFER Education to Employment, QA | Permalink.